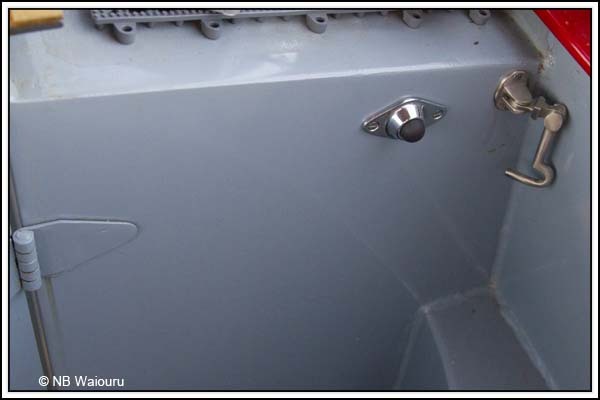 Something that has been annoying me since we started cruising was the way the rear cabin doors swing open and the exterior stainless steel door hook eyes then strike the rear bulkhead paintwork. This tends to happen almost every time someone opens the doors to exit the cabin. Actually it’s rather hard to climb up the rear steps and open the doors without them striking the bulkhead. The doors are always going to swing open because the bow is higher than the stern. 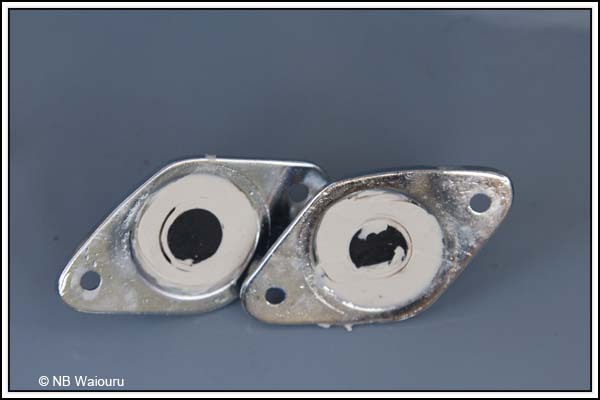 You might recall we went to the chandlery below Braunston Bottom Lock and purchased two chrome and rubber door stops. I then filled the reverse of the fittings with construction adhesive to minimise the potential for the rubber ‘cushion’ to be ripped off. Today I used a razor knife (box cutter) to trim off the surplus adhesive and create a flush finish. The next step was to establish the appropriate location on the bulkhead for the stops. I want the hook and eye on the door to align with the stop. This was achieved by temporarily securing the stops on the bulkhead with sticky tape. I was going to use duct tape but it has a tendance to remove a layer of paint when it’s taken off. After quite some time I was satisfied with the position of the stops. The screw holes were then marked with a felt tip pen. In the past the steel drill bit has ‘wandered’ when I’ve attempted to drill holes in the steel. Having learned my lesson I’ve invested in a cheap centre punch and hammer. 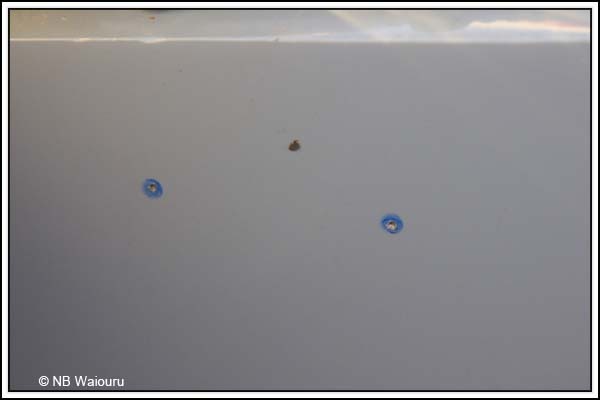 The location of the screw holes were then marked with the centre punch. The stainless steel machine screws are 4mm so I first drilled a 3mm pilot hole followed by a final 3.5mm hole. The holes were then threaded with a 4mm Tap. I was rather relieved to find out the holes were in the correct position for the stop. No, the job isn’t complete! The threads will start to rust if left like this so the screws and stops were removed and a small bead of construction adhesive applied to the hole. 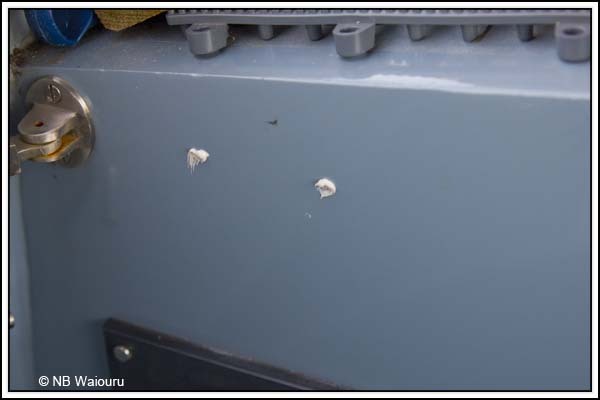 The stop was then reinstalled with the screws carrying the adhesive into the thread which will (theoretically) prevent rust from forming. The ‘eyes’ on the door hook should now strike the rubber stops when the doors open. The next step is to identify a method of holding the rear cabin doors closed when we are in the cockpit. They have a towerbolt on the inside to secure them but we can’t use this from the outside. Maybe some type of magnetic catch is required? I tip I got from our bathroom tile fitter that also works when drilling polished surfaces is to use a strip of masking tape and then drill through that. The tape helps to stop the drill careering off in odd directions. Yes, I've done that before on tiles but unfortunately it didn't work for me on the steel. 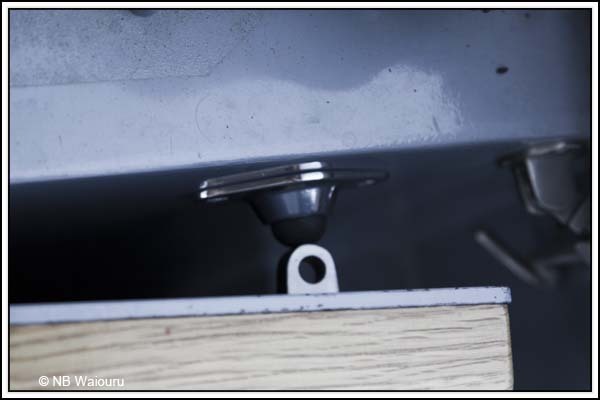 To keep our rear door closed I have what is known as a Dutch or sometimes a French bolt going down into the rear door frame. I close it from the outside by just reaching over the door. That's very similar to our setup. But we are OLD and I now can't reach that far! :-) However I may have another idea.